Lori Harward captured a silver medal. 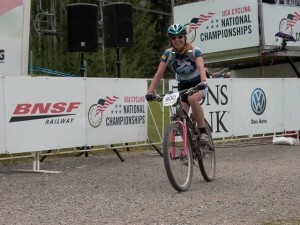 Utah had a National Competition winner and seven podium finishers in the 2012 MTB National Championships at Ketchum, ID Sun Valley. Paul Lasteyo in third position just before heading out on main loop at MTB Nationals. Master Men's 50-54 category 2 rider John Higgins from Salt Lake City, Utah won his age-graded National Competition and was joined on the podium with Ski Utah rider Paul Lasteyo, Salt Lake City, Utah with the silver medal. Junior 15-18 category 3 rider Daniel Riley, Park City, Utah, won his category at USA Cycling Mountain Bike Nationals in the first race of the day on Thursday, July 5th. While unavailable for an interview after the event, judging from the five minute gap he held over the second place finisher, Riley obviously found his comfort-zone on the twenty mile course with over 2500 feet of climbing. Master Men's 30-34 category 2 rider Eric Greenwood, Ogden, Utah and Master's Men 35-39 category 2 rider Filip Wojcikowski, Park City, Utah rode to respective silver medals. Senior Men 19-29 category 3 rider Dalin Hatch rode to a bronze medal, and Master Women's 40-44 category 2 rider Lori Harward, Salt Lake City, Utah impressively took a silver medal. Overcast with a sprinkle or two with a breeze on the ridge tops, temperature in the low 60s in the morning events has given way to mostly sunny skis for the short-track racing in the afternoon. 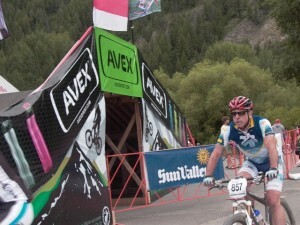 2 Responses to "Higgins Rises to Top at Mountain Bike Nationals in Sun Valley"
As for the Pro races, Alex Grant (SLC, Cannondale Factory Racing) apparently powered through a cold to finish in 8th. Brent Pontius (Ogden, Roosters/Bikers Edge) was the only other local male Pro to roll to the start line Saturday afternoon, turning in a very respectable 34th place finish. In the Pro women’s race, Evelyn Dong (Park City) had a great race and finished in 10th. http://www.cyclingutah.com/category/racing/mountain-bike-racing/ that fill in a couple of the gaps in coverage (but not all of them).